When you're an avid swimmer who wears contacts, getting in that quick dip becomes a bit more complicated. Because of the risk of eye infection, it's best to take your contacts out before you get in the pool. However, if you choose to wear them, take some steps to ensure your eyes stay healthy and talk to your ophthalmologist about the proper safety and hygiene procedures. Even in chlorinated water, dangerous bacteria and other organisms can thrive. If you open your eyes underwater while wearing contacts, these can squeeze behind your lenses and infect your eye. 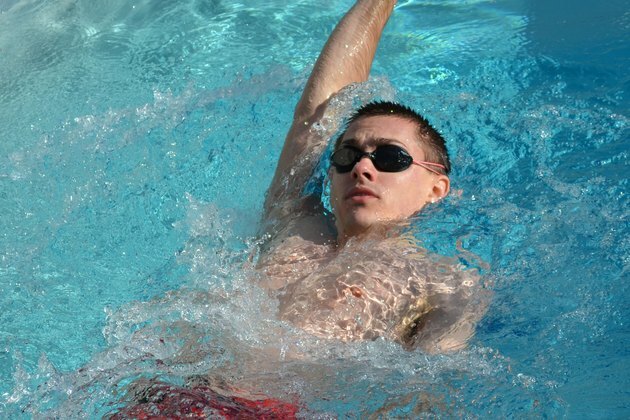 Keep water out of your eyes and off your lenses by wearing goggles. These can be the small goggles that have separate pieces for each eye or the larger style that has one big viewing area. Make sure the goggles fit tight enough to keep out all water before jumping in. When you don't want to wear goggles, choose activities that don't involve splashing so water doesn't inadvertently end up in your eyes as you swim. Use relaxed swim strokes that keep your head above water at all times and close your eyes as much as possible. When you shower off as you enter or exit the pool, close your eyes and keep your face dry; tap water can be just as dangerous as pool water. The same is true of using a hot tub, if your pool has one nearby to warm up after your swim. If you swim while wearing contacts, even if you don't think water splashed in your face, remove your contacts as soon as you get home. With daily contacts -- the kind you throw away each night -- go ahead and replace them. When using contacts that are not disposable, take them out and clean them with cleaning solution recommended by your eye doctor. 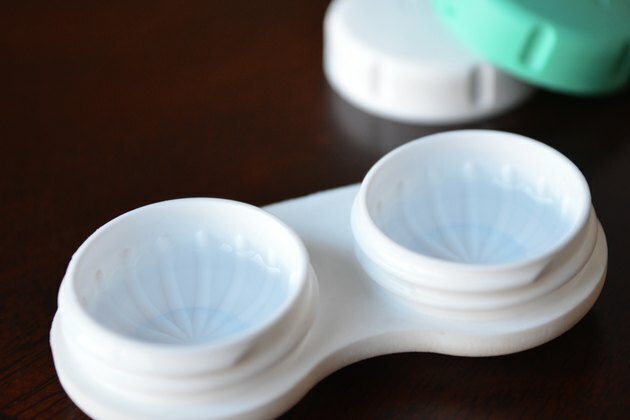 You can put some contacts back in immediately after cleaning, while others need to soak overnight. Even with the best precautions, problems can still arise when you swim while wearing your contacts. If you notice any redness, swelling or pain in your eye soon after swimming, see your ophthalmologist immediately. Even a short delay can lead to longer recovery times or more dire consequences, such as loss of vision in an infected eye. The symptoms could be basic irritation from chemicals in the water, but only your eye doctor can diagnose that for sure. ABC News: Can I Swim With My Contact Lenses?